The music department has had a busy term rehearsing and performing for several concerts. During the term we launched the new Friends and Family Concerts, of which there have been two so far, one in October and one in November. They take place at 4pm in the Drama studio and provide a performance platform for students of all abilities to perform in an informal environment in front of their friends, families and each other. Performances have included ensemble work students have been learning and composing in curriculum lessons, GCSE solo performances and solo performances students have been working on with their instrument teachers. Students from all year groups have taken part. In September the year 10 class worked with professional musician and composer Laurel Swift and a group of professional singers. They performed pieces to our students from Travelling with Thomas, which is a project exploring and developing a folk musical. The students wrote new verses for one of Laurels songs which the singers learnt in record time and performed. We will be welcoming Laurel back into school in the new year for the final two phases of her project. In October our singing teacher Miss Kvaerndrup opened up her choir rehearsal to other students for an informal concert. It was great to see Room 43 filled with students keen to hear their friends perform and for our singing students to practice performing the pieces they have spent a lot of time rehearsing. On Thursday 30th November we our held our Winter Concert in Tylers Hall, with 30 students performing from different year groups. 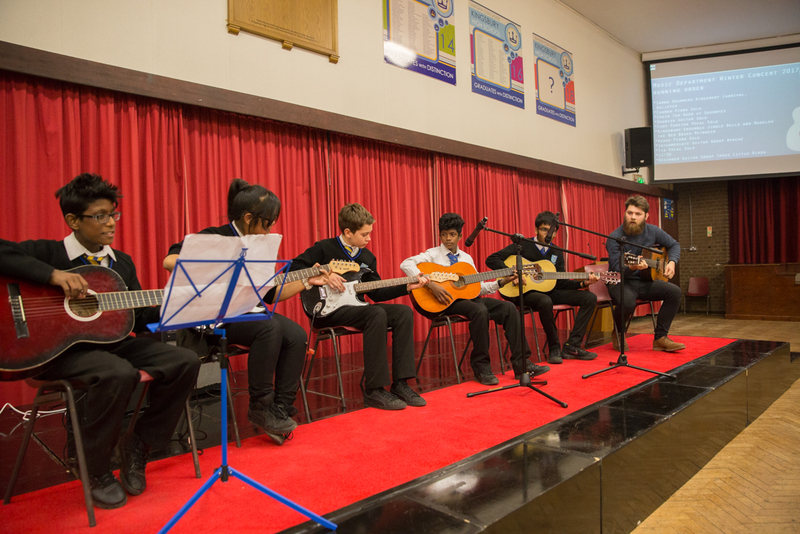 The concert was a showcase for our growing and blossoming ensembles and included guitar groups, choir, samba drumming and our newly formed Kingsbury Ensemble, along with some outstanding GCSE students performing solos. We ended the concert with Three Little Birds performed by the Beginner Guitar Group with students and their families singing along. This entry was posted in Kingsbury High School and tagged Kingsbury High School, school concert by kingsburyhighlondon. Bookmark the permalink.